The Chemin de la Corniche, in Luxembourg City, seen from Rue Münster Bridge. The Chemin de la Corniche has been described by a Luxembourgisch writer as the 'most beautiful balcony of Europe'. 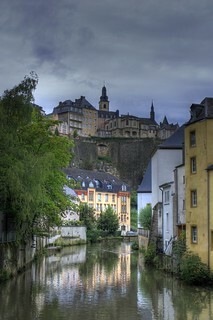 From this scenic promenade the whole 'Grund' part of the Luxembourg City can be seen. Also the entrance to the Bock casemattes and other fortifications are situated here.